With 132 presets and 44 Distinct amp models. Musikmesse 2011 PRESS RELEASE: Supercharged to befit the name: The Valvetronix Pro Series. Introducing the new VTX150 Neodymium - the pinnacle of VOX modeling amps. 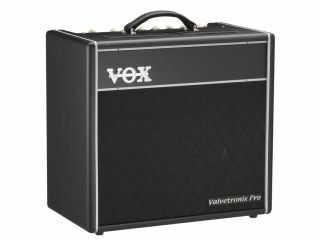 VOX Valvetronix amps are famous for their highly realistic amp models and their versatile array of in-demand sounds and effects. Now, VOX has created a new breed of Valvetronix amp: The Valvetronix Pro. Extension speaker output jack, obtain up to 300W of output power. The heart of every Valvetronix amp is the "Valve Reactor" circuit. First introduced in 2001, the Valve Reactor circuit uses a real vacuum tube to provide Valvetronix amps with that all important true tube tone. For the Valvetronix Pro Series, the Valve Reactor circuit has been enhanced, using an EL84 tube in place of the traditional 12AX7 tube to create a more accurate tube sonic signature. In keeping with its flagship status, the VTX150 Neodymium boasts 44 amp models - the most in any Valvetronix amp - along with a diverse selection of pedal, modulation, delay, and reverb effects to refine your sound. The speaker is also a crucial element of any amp's sound. The Valvetronix Pro Series uses a Celestion VOX NeoDog speaker, created using a lightweight and powerful neodymium magnet. This premium speaker allows the VTX150 to efficiently project the modeled amp tones, as well as the subtle nuances and thunderous dynamics produced by the power amp circuit. Ample expandability is provided, including an effect loop and an extension speaker output. As the Valvetronix "Pro" name implies, the VTX150 Neodymium boasts the sound, features, tone and operation that professionals demand, delivering superior sound in any musical situation. The heart of every Valvetronix amp is the Valve Reactor circuit. This analog circuitry uses a real vacuum tube to shape the sound in a way which faithfully creates the fat drive tone, wide dynamic range, subtle picking nuances, and quick response of a tube power amp. Previous Valvetronix amps models used a 12AX7 tube in the Valve Reactor circuit. The Valvetronix Pro Series instead uses an EL84 vacuum tube in the Valve Reactor circuit in order to reproduce these same tube tone elements with even greater realism. This new design succeeds in making a major advance over previous modeling amps, attaining the overwhelming sense of power and distinctive tonal characteristics of an all-tube power amp. The new VTX150 Neodymium boasts an amazing collection of 44 distinct amp models - a new milestone for Valvetronix amplifiers. The sonic character of numerous guitar amps loved around the world has been meticulously analyzed in order to faithfully reproduce the sound quality of each original amp; coveted amps of the past, costly high-end tube amps and even modern ultra high-gain amps. The legacy of VOX amps is also well represented, starting with the vintage AC30 and AC4, and also including the current model of AC30. From the distinctively fat and warm sound of tubes, transparently clean sounds, up to the powerful distortion of a colossal amp stack, this single amp is all you need. Volume, Gain, and Master Volume controls provide key levels of controlling your gain to achieve a wealth of clean, overdriven and distorted sounds. In addition, the new VTX150 Neodymium features an altogether unique Power Level control. By lowering the Power Level, it's possible to achieve high levels of gain and distortion at any listening level. The Power Level control allows you to take full advantage of your Valvetronix Pro Series amp in any situation. One of the best features of VOX Valvetronix amps is the ability to combine the built-in effects with the onboard amp models to create a complete and powerful sound. Just as with the effects, the VTX150 Neodymium makes no compromise when it comes to effects, boasting a level of quality that rivals top standalone units. The broad array of effects is divided into two sections: Pedal effects such as stomp-box style distortion, wah, and compressor; and Modulation/Delay effects such as chorus, flanger, and tape echo. In each section, there are 11 effects to choose from. Featuring easy-to-use settings, you can simultaneously select the effect type and adjust its parameters. In addition, there are three types of Reverb (Room, Spring, and Hall). With the addition of Noise Reduction, up to four different effects (five, if using a multi-effect) can be used at the same time. Pedal-type effects provide one editable parameter; modulation/delay-type effects provide three, offering plenty of control to customize your own sound. For each of the 44 amp models, the VTX150 Neodymium provides three variations - Basic, Effect, and Song - delivering a staggering total of 132 preset programs, expertly voiced and ready for immediate use. The Basic variation offers an all-around ideal setting that will let you enjoy the true character of that amp model, and is also a good place for you to start when editing your own sound. The Effect variation provides an easy way to experience the enormous potential of the VTX150 Neodymium's integration of amp models and effects. The Song variation delivers a faithful recreation of the signature sound used by a famous guitarist to perform one of their classic tracks. You can also create and store eight of your own edited programs; 16 when using the optional VC-12SV foot controller. The VTX150 Neodymium is more than impressive used all on its own. Even so, a rich variety of connections allow for plenty of expansion capabilities. The extension speaker out jack lets you connect a speaker cabinet (150W / 8Ω) of your choice. The VTX150 Neodymium is capable of 150W of output when used by itself, and connecting an external speaker will boost this to a maximum of 300W. Use the effect loop to insert an external effect processor into the signal path. For direct recording or private practice, the line/headphone output is equipped with the simulated response and character of a speaker cabinet, so you'll enjoy the natural spatial sense of playing through speakers, even when using headphones or when connected to a mixer or recording system. Plug your CD or MP3 player into the AUX input jack and enjoy jamming along with your favorite songs. In addition, the tuning function needed by every guitarist is built in, eliminating the need for a separate tuner. Using the optional VOX VC-12SV foot controller or optional VFS5 foot switch will allow you to control the VTX150 Neodymium's functions remotely: change programs, turn effects on/off, and use tap tempo to set the delay time or modulation speed. When using a VC-12SV, the number of user programs is doubled from 8 to 16 programs. The VC-12SV also provides a volume pedal and expression pedal, which you can use to control volume, wah, or the parameters of each effect, offering even more live performance potential.